Potential contractor to complete Phase 2 of Oakland’s DAC surveillance system, URS Corp is the largest nuclear weapons contractor for the United States. The company is so integrally involved that it’s “federal” web page includes a picture of a nuclear missile-armed submarine. In March of 2013 the city of Oakland signed a contract with Science Applications International Corporation (SAIC) for design and construction of the first of two phases of a city-wide surveillance system called the Domain Awareness Center, or DAC. The basic infrastructure to link up cameras and sensors with servers running powerful software, hosted in several command rooms at the Port and in the city’s Emergency Operations Center, is now mostly complete. Oakland’s DAC surveillance system is not yet fully up and running, however, until Phase 2 work is completed. In July of 2013, against an outpouring of public protest against building the surveillance system, the Oakland city council approved a contract modification for SAIC to complete Phase 2. Recently, however, the Oakland city council learned that its prime contractor for the project is involved in the U.S. nuclear weapons program, a fact that violates Measure T, a city voter proposition that makes Oakland a nuclear free zone. Measure T and Ordinance No. 11062 C.M.S. bar any contractor that is involved in nuclear weapons work from doing business with Oakland, and SAIC’s contributions to nuclear weapons are well-documented. Oakland paused work on the project, and in October the city council authorized its administration to drop SAIC and return to the original pool of vendors who responded to the city’s first request for proposals (RFP) issued one year ago. The original pool of vendors who expressed interest in bidding on the surveillance project included 25 corporations, so surely another with a clean record could be found? It appears, however, that SAIC’s ties to nuclear weapons aren’t unusual inside the industry that sells mass surveillance systems. Many of the contractors that specialize in building giant surveillance systems like the DAC also have nuclear weapons and other arms manufacturing contracts with the Pentagon. Mass surveillance and nuclear weapons appear to go hand in hand in the thinking of the executives who run these companies. For example, engineers with URS Corp responded to Oakland’s original RFP for the DAC. URS Corp is a prime contractor for theU.S.nuclear weapons research, design and testing laboratories at Los Alamos, New Mexico and Livermore, California. URS is part of two for-profit limited liability corporations that manage theU.S.nuclear weapons labs for the National Nuclear Security Administration. URS also operates the salt mines in southern New Mexico where deadly radioactive waste from theU.S.nuclear weapons programs is buried. Schneider Electric also responded to the original RFP and appears to be in the running to get the DAC Phase 2 contract. But again, like URS and SAIC, Schneider Electric has ties to nuclear weapons. In marketing materials Schneider lists Los Alamos National Laboratory, the nuclear weapons facility managed by URS, as one of its clients. Schneider Electric also lists the Pentagon, Lockheed Martin, and Wright Patterson Air Force Base as clients. Lockheed Martin has long been one of the prime nuclear weapons contractors for the United States government. Wright Patterson Air Force Base hosts several units that research and deploy nuclear weapons. Schneider Electric’s Pelco subsidiary has installed surveillance systems at the Navy’s Kings Bay Strategic Weapons Facility, a port that harbors nuclear armed submarines. Marketing materials created by Kratos Defense and Security Solutions, Inc., another potential contractor that might build Phase 2 of Oakland’s Domain Awareness Center. And Kratos has direct links to nuclear weapons too. Kratos designed, built, and manages a security system for the National Nuclear Security Administration’s use at the Nevada Test Site, a testing ground for nuclear weapons that in recent years has been considered as the site of a possible radioactive waste dump. Last year Kratos won a multi-million dollar contract from the U.S. Strategic Command (STRATCOM) to provide “worldwide Radio Frequency (RF) interference geolocation services” for the Pentagon’s use. Among other things, STRATCOM commands the nuclear weapons forces deployed by the Air Force and Navy, and Kratos’ contract relates to this nuclear mission. The list of potential Oakland DAC contractors includes still more companies deeply involved in weapons manufacturing, including nuclear weapons. Two representatives from Unicom Global attended the Port of Oakland’s October 22, 2013 pre-proposal meeting for the DAC. Unicom Global is owned by Beverly Hills entrepreneur Corry Hong, formerly a lead guitarist in a South Korean rock band who became a software designer after immigrating to the US. Unicom is a holding company owns several major federal technology contractors including GTSI. GTSI was suspended from doing business with the federal government in 2010 due to accusations the company was scamming the Department of Homeland Security. Hong and Unicom bought GTSI last year, and since then GTSI and Unicom have regained considerable business with the military and DHS. Unicom’s GTSI has even contracted with the National Nuclear Security Administration. A 2009 brochure from GTSI that is available on Unicom’s web site discusses one such contract in which GTSI provided the U.S. nuclear weapons laboratories with “classified removable electronic media,” or CREMs. CREMs are storage devices which have been used to save nuclear weapons design information and testing data. Oakland’s list of potential DAC Phase 2 contractors just keeps turning up companies with links to nuclear weapons. G4S Technology, part of the security company G4S, also responded to Oakland’s DAC RFP and attended to the mandatory pre-proposal contractor meetings. G4S Government Solutions has the prime contracts to guard most of the U.S. nuclear weapons complex across four states. G4S mercenaries are stationed at the Y-12 National Security Complex and Oak Ridge National Laboratory in Tennessee, the Savannah River Site in South Carolina, the Nevada Test Site, the Sandia National laboratory Tonopah Test Range, also in Nevada, and the Hanford Site in Washington state. So can Oakland actually pick a contractor to complete its mass surveillance system who doesn’t violate the city’s anti-nuclear ordinance? Perhaps a more important question is the one being asked by a growing coalition of residents opposed to the project: should Oakland even build the DAC? Screenshot from SAIC’s jobs web site. 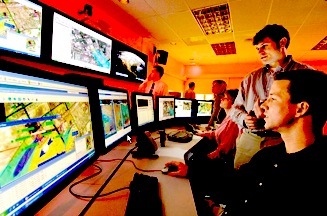 SAIC develops surveillance technologies for many branches of the federal government, as well as local governments and police agencies. In 1988 the Oakland city council passed the nation’s most ambitious anti-nuclear ordinance, banning any and all activities that would advance the development and deployment of nuclear weapons. It was a big deal, not like the previous mostly symbolic ordinances passed by other towns and cities far from the nation’s nuclear labs and military bases. The city of Oakland lies just south of Berkeley where in the 1940s and 1950s much weapons research was conducted. Weapons and components were transported through Oakland’s Port and across roads and highways and rail road routes traversing the city. Atomic weapons that later decimated the environments of South Pacific islands, causing cancers among islanders and destroying their homes were shipped through Oakland. In the 1960s Berkeley’s research was consolidated at Lawrence Livermore Laboratory in southern Alameda County, but for decades Oakland was host to nuclear weapons contractors and federal offices involved in the design and deployment atomic weapons. (In fact this is true today, the subject of a future blog post perhaps.) The Navy sought to home port a nuclear-armed squadron in the Bay Area in the 1980s, and Oakland’s anti-nuclear ordinance was a direct effort to resist the further nuclearization of the region. In 1990 a federal judge appointed by Ronald Reagan slapped down most of Oakland’s anti-nuclear law, calling it unconstitutional and claiming that it interfered with national security. However, one portion of the anti-nuclear ordinance stayed on the books. Oakland would continue to refuse to enter into contracts or otherwise spend city funds on work done by corporations involved in the US nuclear weapons program. Both the spirit and letter of this law were thrown out three years ago when the Oakland city council summarily agreed to the massive port-city surveillance system called the Domain Awareness Center. The contractor building Oakland’s camera and sensor network is Science Applications International, a giant military-industrial corporation that has helped the US Defense Department develop, build, and deploy nuclear weapons, among many other killing technologies. And the Oakland contract with SAIC would seem to violate the spirit of another city of Oakland resolution, the anti-SB 1070 law that was passed in 2010 to oppose Arizona’s anti-immigrant law. Oakland’s anti-SB 1070 resolution requires the city to boycott Arizona, and companies with headquarters in Arizona, due to the state’s racist and militarized immigration policies. SAIC has a major office in Arizona and has helped the federal government build a massive border wall and surveillance system. A portion of the gigantic wall built by SAIC along the US-Mexico border, a portion of which spans Arizona. SAIC’s anti-immigrant technologies probably don’t violate Oakland’s anti-SB 1070 ordinance because the company’s contracts are with the federal government, and not the state of Arizona. SAIC is headquartered in Virginia, and only has branch offices in Arizona. Nevertheless, SAIC is perhaps the single largest provider of border surveillance technology to the government. SAIC has multiple offices in Arizona where its assists the Department of Homeland Security in its historically unprecedented effort to wall off the US-Mexico border and deport millions of human beings. 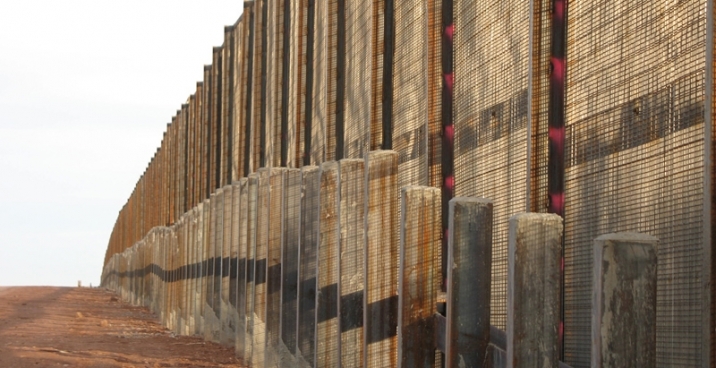 On SAIC’s web site the company proudly advertises the 60-mile border wall it helped build for the Department of Homeland Security in Arizona. Screenshot taken from SAIC’s jobs web site. SAIC is hiring interrogation trainers to teach US military personnel how to interrogate captives and prisoners. The work is carried out at Fort Huachuca, an Arizona military base where SAIC also assists in drone training and operations. SAIC has dozens of job openings at its Arizona offices currently. The company is hiring biometric technicians to develop camera-linked computer systems capable of discerning identity from facial recognition and body shapes. These technologies could someday be incorporated into Oakland’s Domain Awareness Center system, according to discussion between SAIC and city officials. 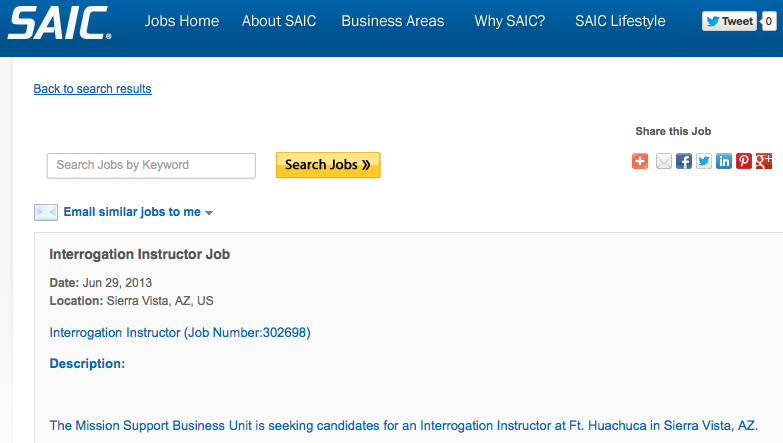 At its Fort Huachuca office SAIC is hiring staff for its “human intelligence” program, a major military contract to train interrogators and spies within the US military. SAIC is deeply integrated into the US military’s espionage and surveillance activities. Arizona is one of the major locations where SAIC and the Army develop these technologies. Fort Huachuca, located in southern Arizona near the Mexico border, was founded in 1877 by the US Army during their war of extermination against the Apache nation, and other southwestern Indians. For Huachuca grew afterward as an outpost against Mexico from which the United States had seized a quarter of North America. Today the desert outpost is also one of the US military’s major drone warfare bases. SAIC is one of the main contractors providing technology and training for Army and Navy drone weapons systems at Fort Huachuca, and drone surveillance systems based at Fort Huachuca are reportedly used in border patrol operations, but mostly in overseas theaters of war. As the LA Times reported in 2011, SAIC employees are part of the “kill chain” in drone warfare, carrying out crucial roles in the drone missions employed by the Obama administration to kill thousands in the Middle East and Central Asia. Just last month the military re-upped SAIC’s drone contract to assist Army personnel in operating and maintaining the new weapons. 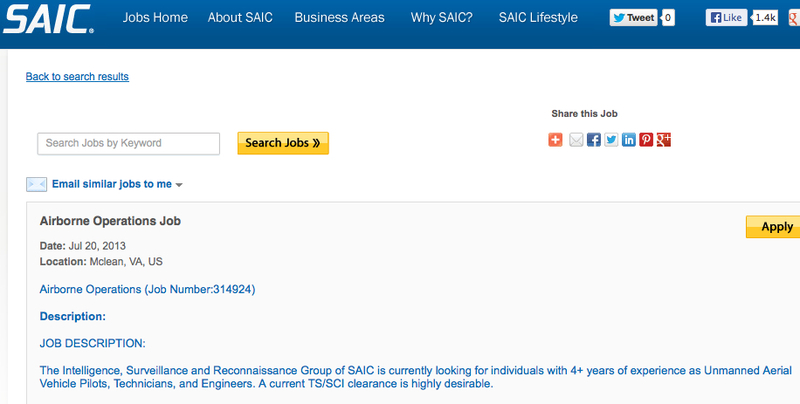 Screenshot of SAIC’s jobs web site, advertising employment opportunities for drone operators. SAIC’s staff are in the “kill chain” of the US military’s controversial drone warfare programs. SAIC’s nuclear weapons contracts are too numerous to try to list. SAIC has contracted with the US nuclear weapons complex since the mid-1980s. SAIC has taken billions in payments from the US Department of Energy and the National Nuclear Security Administration to conduct studies and carry out contract work for nuclear weapons development as well as lead up the government’s site planning and environmental compliance efforts at the major weapons labs in New Mexico and California. One of SAIC’s latest nuclear weapons-related contracts is a $228 million work order with Sandia National Laboratories in Albuquerque, New Mexico. In addition to designing and testing nuclear weapons, Sandia also develops weapons and surveillance technologies for the CIA, NSA, and other federal spy agencies. SAIC also serves the military branches that deploy nuclear weapons. For example, in 2009 SAIC was paid $10 million to help the Air Force reorganize its nuclear weapons command structure. Homeland Security chief Janet Napolitano’s appointment as the University of California’s 22nd president is part of a long tradition of militarizing the university from the top down. 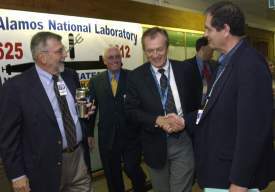 UC president Robert Dynes center front with Los Alamos weapons lab executives. In center background is Robert Foley, UC vice president for Laboratory Management. The poster hanging in the background celebrates Los Alamos Lab’s trident nuclear missile program. Yudof of course was UC’s cigar chomping, bald, and gruff president recruited from the University of Texas in 2008 to replace Robert C. Dynes and whip the school’s administration into shape. Dynes was a physicist who presided over various scandals including one that has been emblematic of the decline of universities across the U.S. over the past two decades: bloated and growing executive compensation packages even while colleges trim their budgets, lay off faculty, and hike tuition. UC’s executives were lambasted in the press for their six-figure salaries and cronyism until the Regents, that lofty board of millionaires, mostly friends and donors to the Governor of California given ultimate power of the nation’s largest university, told Dynes it was time to retire back to his laboratory at San Diego. 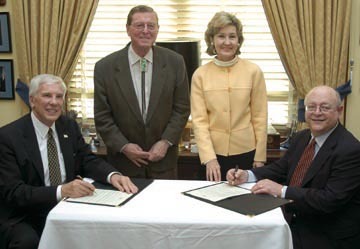 Mark Yudof while president of the University of Texas signing a joint management agreement with Lockheed Martin executive C. Paul Robinson to co-manage Sandia National Laboratories, a nuclear weapons facility in Albuquerque. Sandia Labs also does perhaps a billion dollars of contract research for the CIA, NSA and other spy agencies. Napolitano is a departure from Yudof and Dynes in that she doesn’t appear to have been selected purely for her unique qualifications to handle the crisis de jour for the University. Yudof cleaned up Dynes’ mess. Prior to Dynes was Richard Atkinson, an academic’s academic, a former head of the National Science Foundation, and Chancellor of UC San Deigo. Many UC faculty today look back on Atkinson as the ideal type, his reign the good old days, the high water mark for UC, untainted by worldly corruption and materialism, a set of little cities upon golden California hills where patient scientists and scholars could plod away at their research unhurried and secure in tenure and prestige. But the UC has always been run by cops, spies, and weaponeers. The second board of Regents included Irving Scott, owner of a proto-Northrop Grumman, building warships for the U.S. military. Scott’s company, the Union Iron Works, built the USS Oregon battleship which was deployed in the 1890s to the Philippines where it shelled the Filipinos into submission – for their own childish good said UC’s leaders. San Francisco’s Union Iron Works, a forge for battleships and weapons. The arms factory was owned by one of the UC’s first regents. Dozens of military-industrial executives have held seats on the Board of Regents providing an organic link between the Pentagon’s industrial contractors and the university. UC insider John McCone (right) led the CIA for four years, 1961-1965, and was also a Deputy Secretary of Defense, Under-Secretary of the Air Force, and member of the Atomic Energy Commission. By the time Clark Kerr took the reigns of UC in the 1960s, UC had become the uncontested heavy weight champion of the military-industrial-academic complex. Yale could certainly boast deeper ties and more recruits sent yearly to the CIA, but UC Berkeley had John McCone, industrialist, weapons manufacturer, and chairman of the Atomic Energy Commission, and for his crowning achievement in the halls of the national security state, director of the CIA from 1961 to 1965. Yale sent the future spies; Berkeley’s patron McCone ran the circus. Today there is a building named after McCone on Berkeley’s campus, but history is alive too. If one looks deeper into UC’s federal labs, and into its administration and faculty, one will find live lines to Langley. 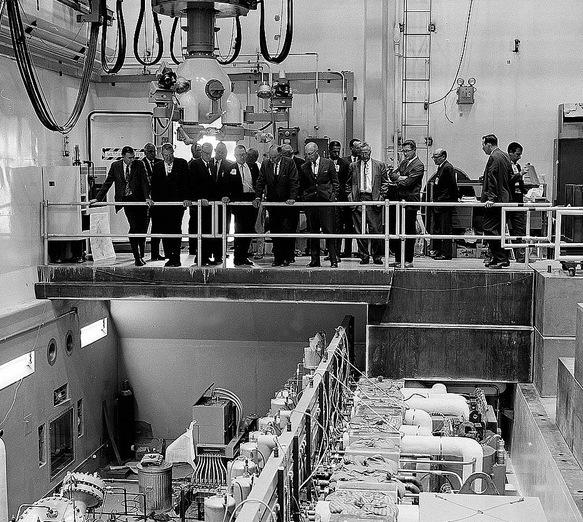 The UC Regents visit a thermo-nuclear weapons testing facility at the Los Alamos Laboratory in the 1960s. McCone was just one among many of UC’s ultra-powerful spooks and Pentagon dons who sloshed money and personnel and gadgetry between Washington and California. After Clark Kerr’s ouster by right-wing, red hunting Regents and the nation’s paranoid FBI director, Charles Hitch took over the nation’s biggest and still fast growing university. Hitch was an economist brought to UC Berkeley to teach business, but his scholarly expertise lay in the economics of military budgeting. Among his greatest hits: The Economics of Defense in the Nuclear Age; Decision-Making for Defense; The Defense Sector and the American Economy, and; Defense Economic Issues, all very dry tomes patiently and authoritatively discussing the most scientifically effective ways to spend billions of tax dollars on nuclear-tipped intercontinental missiles. Professor Hitch was appointed assistant secretary of defense by Kennedy just prior to his taking the post of UC president. It was a natural progression. Skeptics of Napolitano’s nomination to be UC president point out that running a big federal bureaucracy doesn’t make for skills transferable to UC, but in Hitch’s case that was in fact part of the reason the Regents selected him. 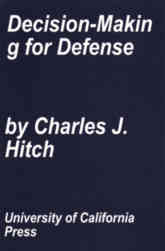 Hitch was a budget man for the Cold War defense contractors and Uncle Sam. He was also chairman of the Budget Review Board and the Capital Outlay Review Board for UC while on faculty. So what better man to run the entire integrated show, not just lecturing and writing about how to budget the military-industrial-academic complex, but in fact drafting the operative budgets for the Pentagon and later the UC? Napolitano does differ from the previous 21 white men who presided over the University of California in being a woman. She’s not different at all with respect to her career and connections to the national security state. Plenty of UC’s leaders, from Chancellors to the Regents to the President have been insiders in the Pentagon, the nuclear weapons complex, and other branches of the warfare state. 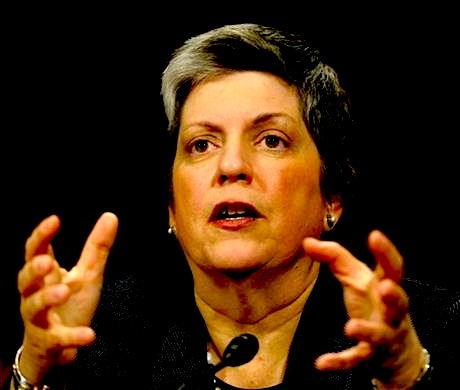 However, DHS chief Napolitano is unlike the previous UC presidents in that she an academic outsider, and that is the singular and new difference she signals, a full departure from a presidency that once required the credentials of scholarship and pedagogy, even while it was scholarship and teaching in service of war and empire.